Today I realize that no matter how modern the communication technology is, there is nothing can replace a warm hug from those we love. That photo box taken after my sister graduation day last month. Can't believe that my sister finally wearing make up and even applied the make up herself on her graduation day. 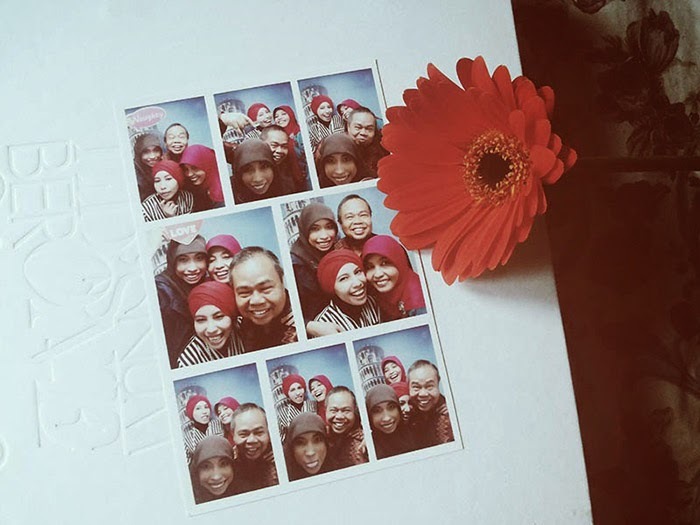 Unfortunately we found that photo box right after my sister changed her kebaya (traditional clothes of Indonesia) into normal clothes. By the way, we just know that Dad is a photo box expert. Because in every studio photo, Dad always got so many direction from the photographer and the result still not that good. It is so fun to see Dad's expression in all those frames and we just couldn't stop to talk about Dad in our way to find an eatery place to celebrate Mei's graduation day. Oh I miss hugging, cuddling and having a chit chat with my family right now. Couldn't agree more. There should be ever more cuddling, hugging and loving in the world !